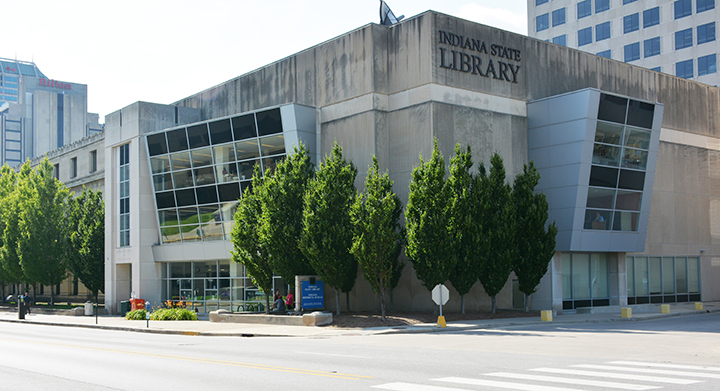 The Indiana State Library’s Library Development Office has had a couple of staffing changes this past year, which has resulted in some confusion over where to direct questions. While all of us are available to help with any question you may have, here’s an updated list of the staff in our office, who are available to serve you Monday through Friday, 8 a.m. to 4:30 p.m. ET. Hayley Trefun – Statewide Library Consultant – Hayley recently joined us as the new consultant specializing in E-Rate and general public library and trustee issues. If you have E-Rate forms to turn in, a long range plan that needs to be approved or a board who needs training, reach out to her at 317-232-1938. Angela Fox – LSTA and Federal Programs Consultant – Angela is the consultant responsible for the Indiana Public Libraries Annual Report and statistics, as well as Library Service and Technology Act grants. Like Hayley, Angela is also available for general public library and trustee questions at 317-234-6550. Nicole Brock – Resource Sharing Coordinator – Nicole is the new coordinator for our resource sharing programs, including: InfoExpress library courier service, SRCS, INSPIRE and the Indiana Share program. She can be reached at 317-232-3699. Connie Rendfeld – Digital Initiatives Librarian – Connie coordinates the Indiana Memory statewide digital collection, and serves as a point person for Indiana’s DPLA hub and the InDiPres digital preservation initiative. Jill Black – Digital Initiatives Specialist – Jill assists with scanning and metadata for Indiana Memory projects, and provides general consultations and training for libraries embarking on digitization projects. Terry Black – Administrative Assistant – Terry provides secretarial support to library consultants in the Library Development and Professional Development Offices. Terry maintains our office records, which include E-Rate forms, legal, history and correspondence files. Terry also maintains the Jobs page and coordinates “Read To Me,” an early literacy program for children of individuals who are incarcerated. You can reach Terry via email or at 800-451-6028 and she will direct your question wherever it needs to go. 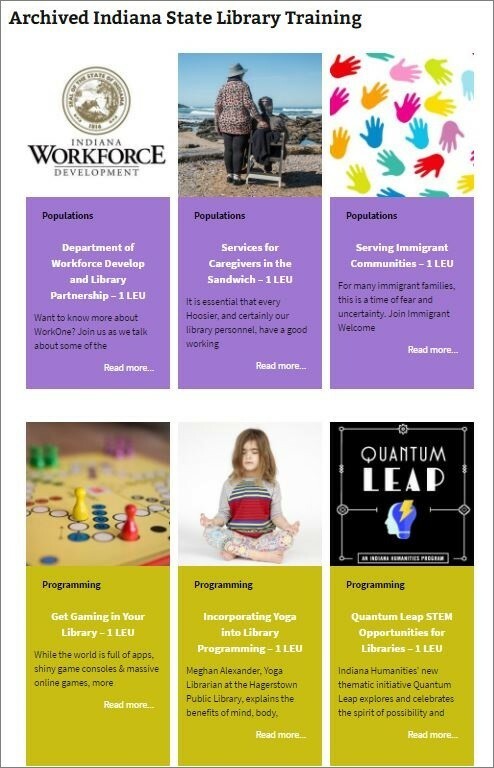 Don’t forget, your library also has an assigned regional consultant from our Professional Development Office who is available for site visits, new director visits, staff trainings, robot/maker/VR kit deliveries and other general questions or advice. Let us know how we can assist your library this year! This post was written by Jen Clifton, Library Development Office, Indiana State Library. Dec. 7, 1941 is the day the Japanese military bombed Pearl Harbor. The event and America’s subsequent entry into World War II are a part of our history, but it is a history many only know from a high school class or from movies. The materials in our collection could be used to add depth to your knowledge of the day “that will live in infamy” or even change your understanding of it. 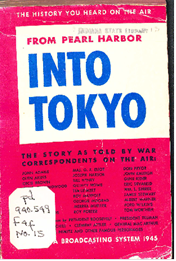 The library’s general collection has a wide variety of materials on Pearl Harbor written from different angles and viewpoints. These include the book “Remember Pearl Harbor” by Blake Clarke, published in 1942. This book has accounts of the attack in snippet style, firsthand viewpoints of military and civilians, that give the feel of what happened that day. 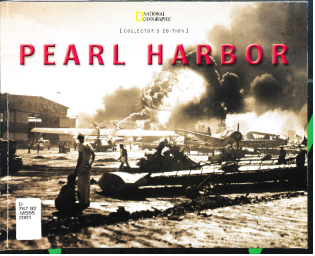 There is also “Pearl Harbor,” a 2001 National Geographic Collector’s Edition book that along with quotes from survivors, has photographs of a time leading up to that day, the attack itself and its aftermath. So, if you’re interested in “the date that will live in infamy,” according to President Franklin Delano Roosevelt, or simply want to impress your teacher or professor with your next history project, come to the Indiana State Library and we’ll help get you the resources you need. 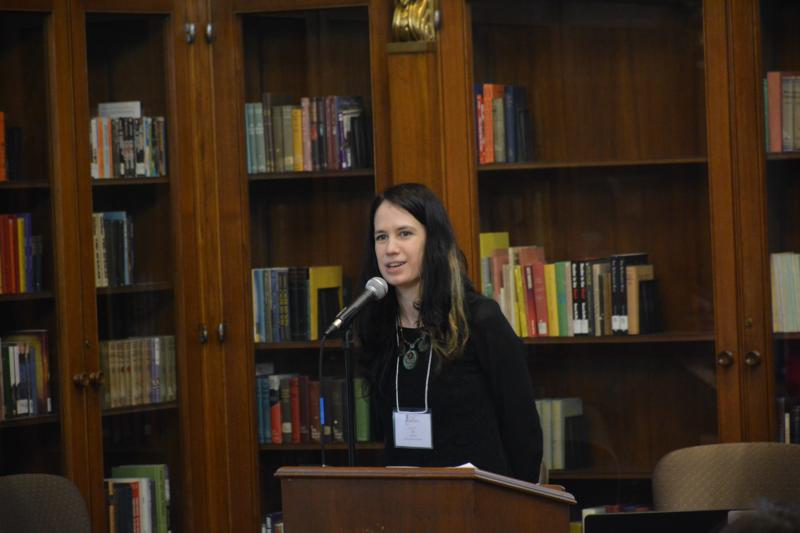 This blog post was written by Daina Bohr, Reference and Government Services librarian. For more information, contact the Reference and Government Services Division at (317) 232-3678 or via email. 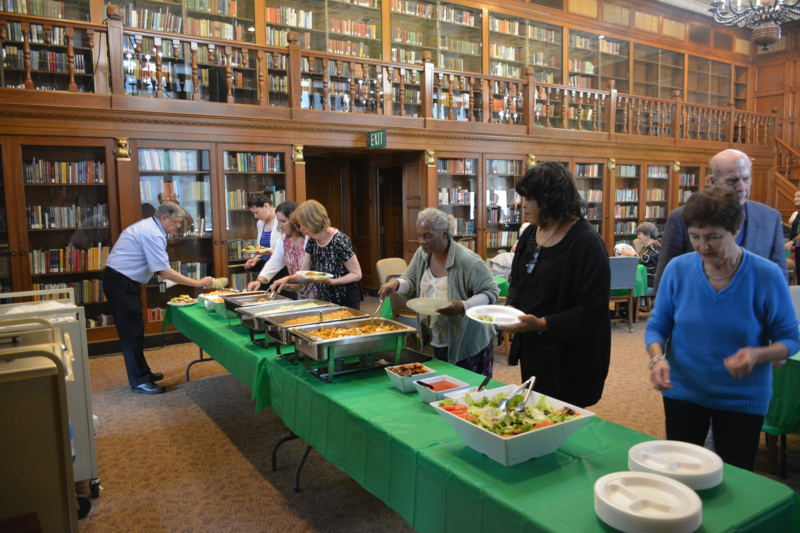 Although April has passed, this is still a good time to reflect on the annual volunteer appreciation luncheon that took place on Friday, April 27, 2018 at the Indiana State Library (ISL). This is the one time of the year where we have the opportunity to formally say thank you to all the special people who give of their time and talents to make so many of the programs here at ISL so successful. 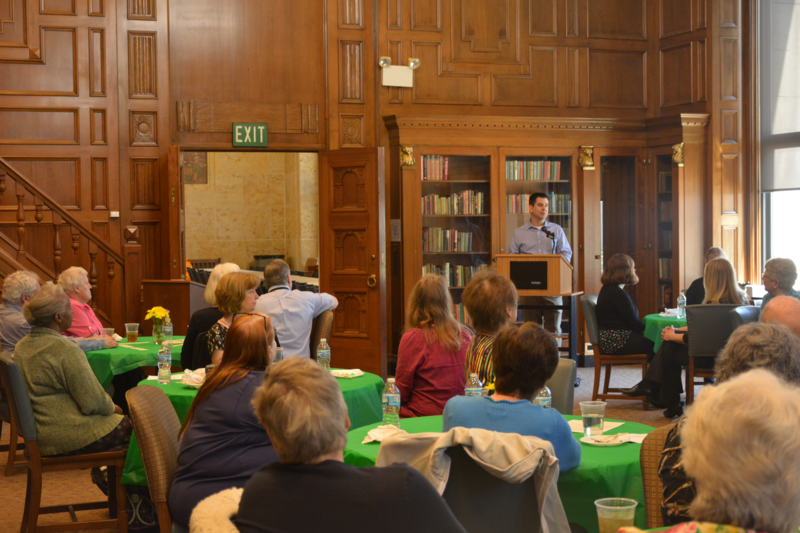 At least 25 of our volunteers were able to attend the luncheon, along with the representatives of the various divisions and areas in the library in which the volunteers serve. The meal provided by Sahm’s Catering consisted of grilled barbeque chicken breasts and ratatouille as entrees, along with various sides, was well-received. Desert was a decorated cake indicating our appreciation to our volunteers. Following the meal, a short program, hosted by the members of our library staff, highlighted the various positions that our volunteers hold. 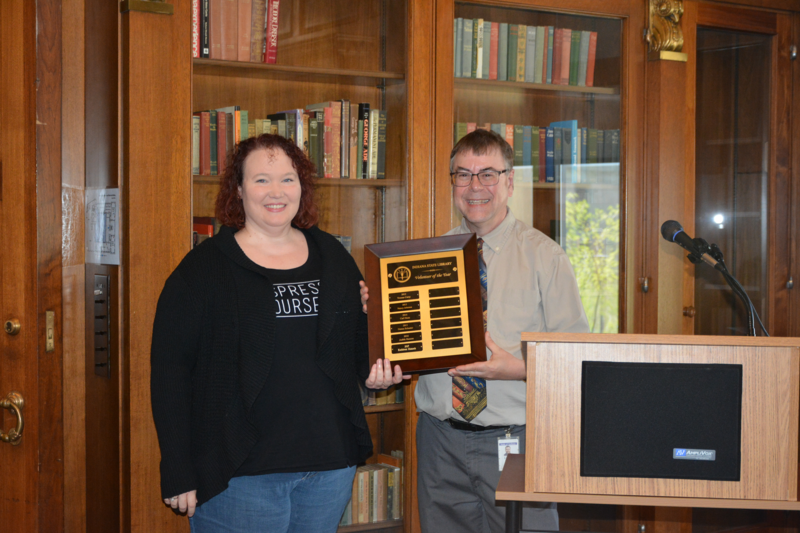 Individuals who act as board members, volunteer for Indiana Voices and serve in the genealogy, manuscripts, cataloging and Indiana divisions were recognized for their dedication to their tasks here at ISL. 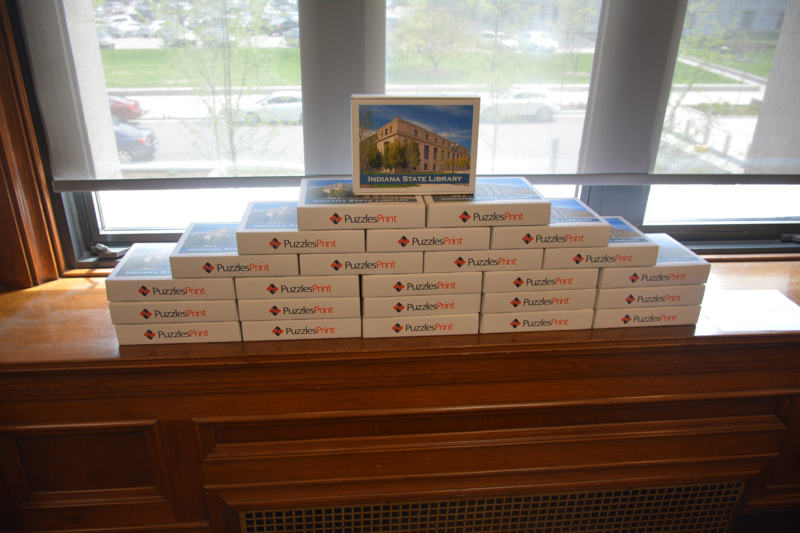 As a part of the luncheon program each volunteer was given an Indiana State Library jigsaw puzzle as a gift. The program closed with special recognition of Kathleen Munsch, as Volunteer of the Year. Kathleen has served as a narrator for Indiana Voices since 2009 and has recorded over 33 titles since that time. The Indiana State Library, once again, would like to thank all of its volunteers for all of their service and for helping our facility provide the best possible service to the citizens of our state and beyond. If you’re interested in how you, too, can help out here at ISL, click here for more information. The volunteer application form can be found here. This blog post was written by Linden Coffman, director of Indiana Voices. For more information about volunteering send an email or call (317) 232-3683. Visit the Indiana State Library on Monday, Nov. 20, 2017, from 4:30 to 7 p.m., for a special open-house reception to coincide with the “Hoosiers at War! 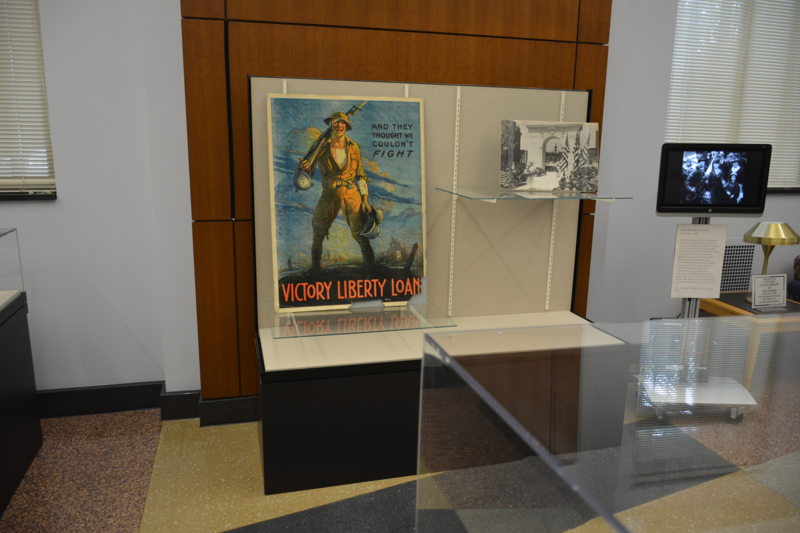 From the Homefront to the Battlefield” exhibit that is currently on display throughout the library. Over 150,000 people from Indiana answered the call to serve when the United States entered the Great War on April 6, 1917. “Hoosiers at War! 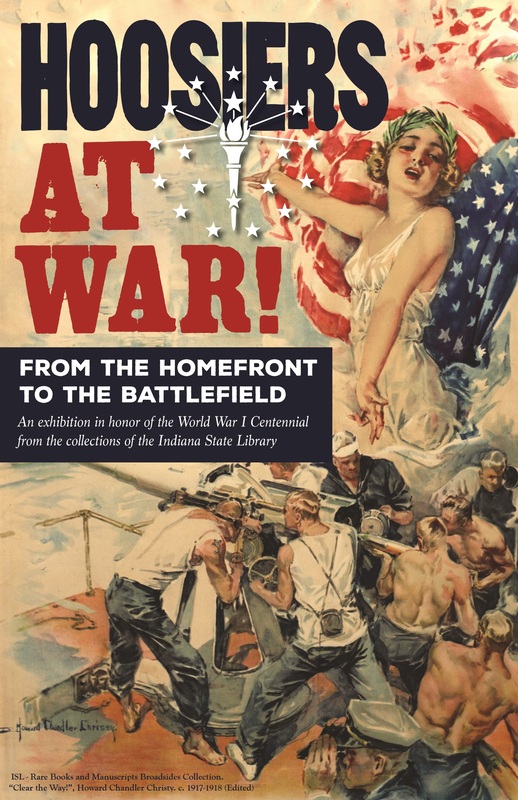 From the Homefront to the Battlefield” showcases publications, correspondence, diaries, photographs and other materials detailing the experiences of Hoosiers during World War I, both at home and abroad. The library will present artifacts of every day Hoosier heroes from the Great War, as well as some specially-selected treasures from the library’s collections. Library tours will also be available and light refreshments will be provided. Click here to register for this free event. Registration is encouraged, but not required. The library is located at 315 W. Ohio St. in downtown Indianapolis. Parking is available in the Senate Ave. parking garage across from the library for $10 beginning at 4:30 p.m. The garage accepts credit cards only. No cash payments will be accepted. Street parking is also available. 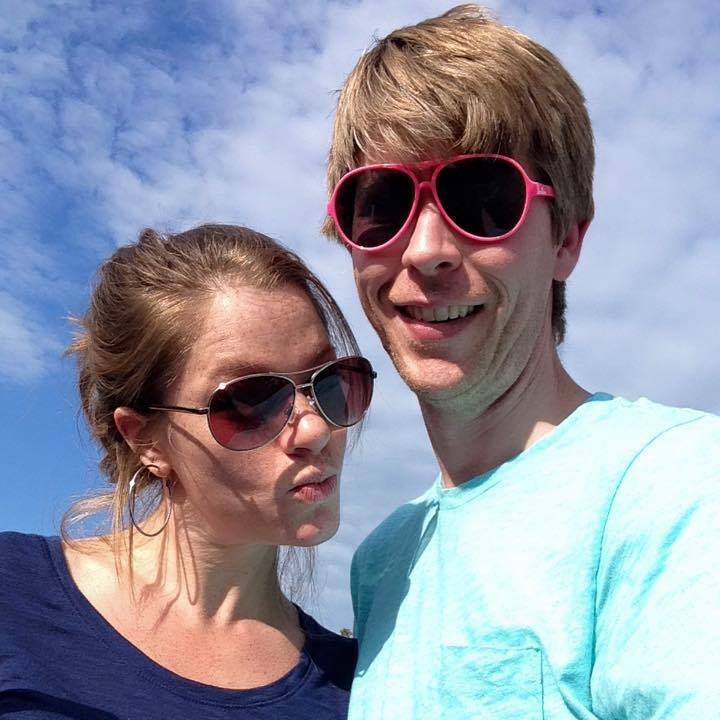 This blog post was written by John Wekluk, communications director, Indiana State Library. For more information, email the communications director. Through the program, incarcerated individuals are able to select books to read aloud and send recordings of the readings to family members, whether it’s children, grandchildren, nieces or nephews. Terry Black processing materials for the Read-To-Me program. 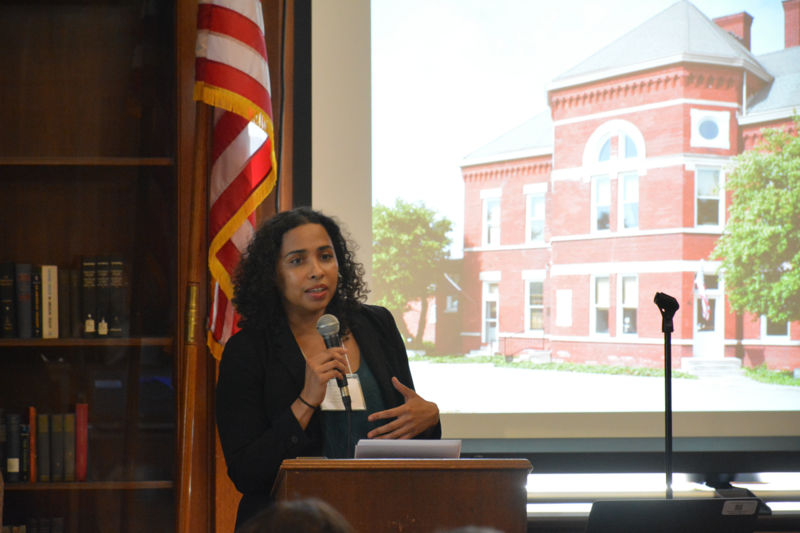 The program was spearheaded by passionate and resourceful former ISL librarians like Marie Albertson and Marcia Smith-Woodard. I now currently serve as the lead coordinator. There are currently five Indiana correctional institutions participating in the program, serving both men and women. I work with the program coordinators inside each of the participating facilities providing the books and supplies needed to record them. Most books are donated to the state library. 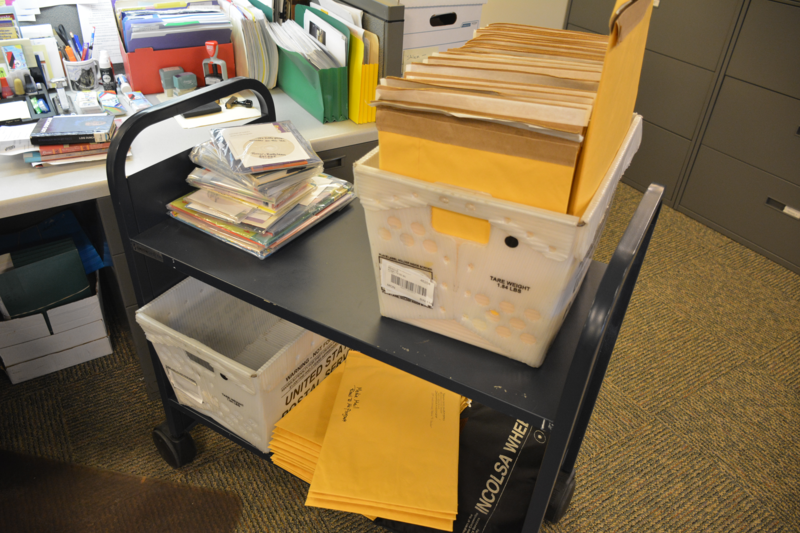 Library Services and Technology Act (LSTA) grant funds cover the purchase of CDs, DVDs or Hallmark Recordable books, as well as the shipping materials and postage for each book. A publishing company provides many chapter books and teen-level books. However, donations of new or slightly used preschool level or early reader books are always appreciated. Materials coming in and going out. The service is in high demand and growing. In 2016, over 421 incarcerated individuals read and recorded for their children. Within the first nine months of 2017, I have mailed 502 packages. After 17 years of the program, I think the program is going very well. Of course, there is always room for improvement. Hopefully, we can continue to support and educate parents to be better readers for themselves and for the children in their lives. I hope to find new avenues to increase interest in the program with positive promotions and incentives. The program could benefit from more funding to provide better quality equipment and supplies. Finally, our goal is to expand the program to the state’s juvenile facilities in some way. Read-to-Me is supported in part through an LSTA grant from the U.S. Institute of Museum and Library Services. This blog post was written by Terry Black. 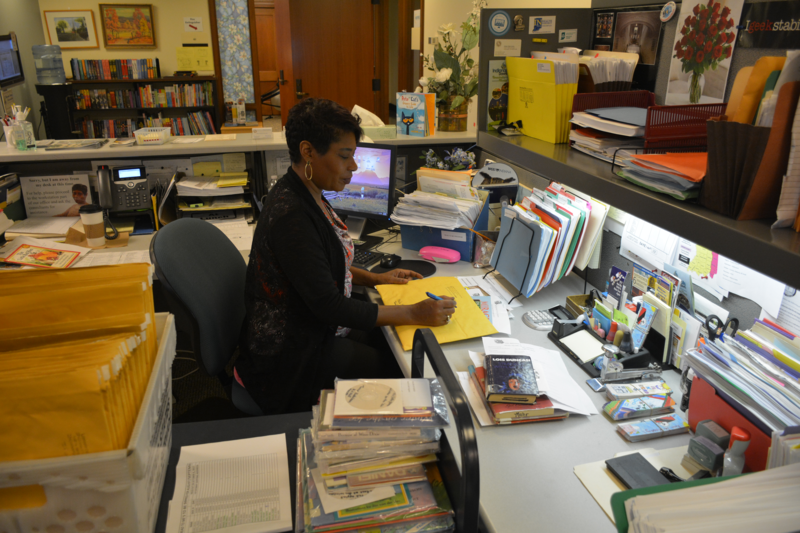 Black is the administrative secretary for the Statewide Services Division. She can be reached at via email. The website will be updated gently in stages. A major overhaul to the archived webinar page has already been completed. The next phase will tackle the main menus and the initial landing pages and then more changes will spread out from there. The look of the site will mostly remain the same, but watch for a new menu for important forms, more ISL staff on the contact page and the changes to the Archived Webinar page. Lots of text, arranged by date, with the newest webinars at the top and it linked out directly to YouTube. Each webinar has a landing page where ISL can link to additional resources about the topic and each webinar has a category at the top of the block of text (Populations and Programming are shown here) that are color-coded and alphabetized. Check back often to observe all of the updates. Submitted by Suzanne Walker, supervisor of the Professional Development Office at the Indiana State Library and co-director of the Indiana Center for the Book. Compared to many of her previous paintings, often characterized with seemingly chaotic textures, drips, brushstroke and colors, “Skybridge” represents a moment of pause and reflection; a breath of calm in the middle of the storm. The “Skybridge” series, created over a period of six months, is the first group of paintings Stahl has created with the intention that they be viewed together in a particular order to allow the viewer to move through this achievement of calm with her. It portrays a reflection of the inner self: how we process and compartmentalize; how we meditate on our daily lives; how we release internalized anxiety; and, how, in the end, we find ourselves inside. 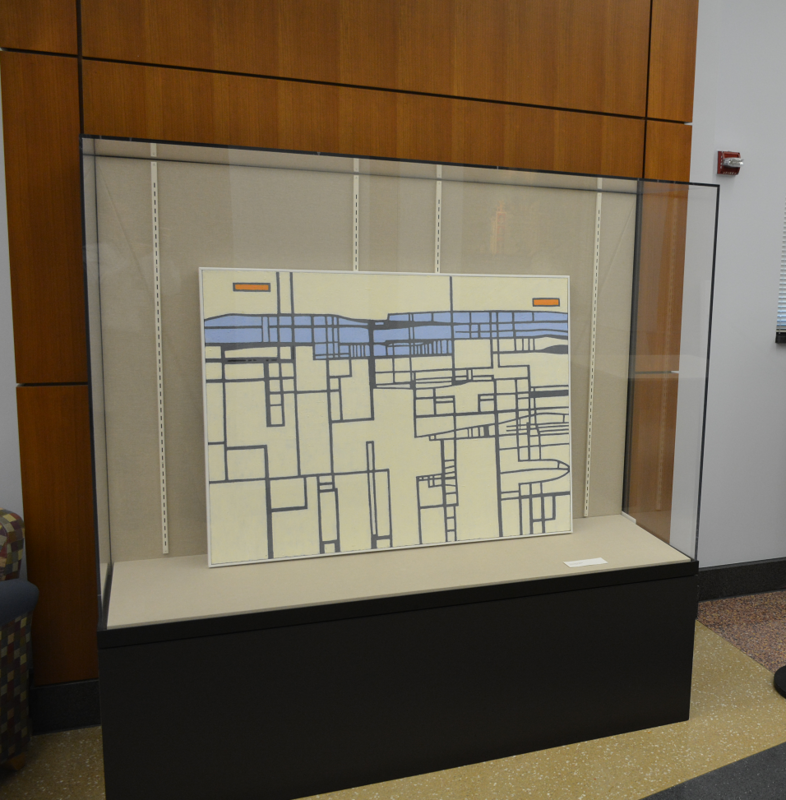 “Skybridge” will be on display in the Exhibition Hall of the Indiana State Library from Thursday, April 13, 2017 to July 12, 2017. For hours of operation, directions and parking information, click here. Born in Vincennes, Ind., Stahl moved to Indianapolis in 1992 after finishing her MFA in painting from the University of Pennsylvania. While earning her BFA in painting from Indiana University in Bloomington, she received an Honors Division Research Grant to study in Florence, Italy. 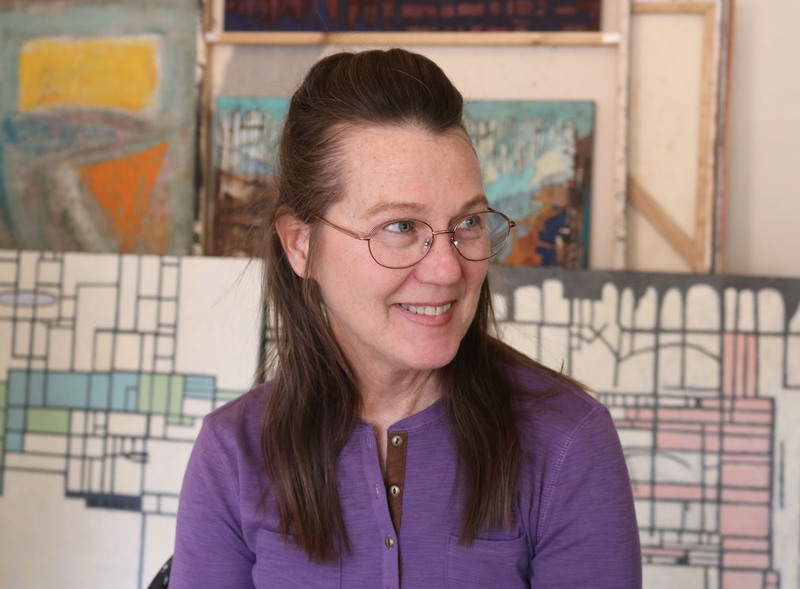 In addition to being an accomplished fine artist, Stahl is also the founder and owner of Stahl Studios Inc., which specializes in commercial and public art, through which she is perhaps best-known for the larger-than-life Indiana Pacers schedule wall near Bankers Life Fieldhouse. Her large-scale mural work always begins with a grid, enabling her to scale the original, smaller mural design to the massive size required for the wall. After many years, the concept of the grid has come to play an important part in her more abstract fine art pieces. For Stahl, this grid represents the connectivity of all matter, including all of us. This blog post was written by Rebecca Shindel and Bethany Fiechter, exhibition chairs, Indiana State Library. For more information, contact the Indiana State Library at (317) 232-3678 or “Ask-A-Librarian” at http://www.in.gov/library/ask.htm. 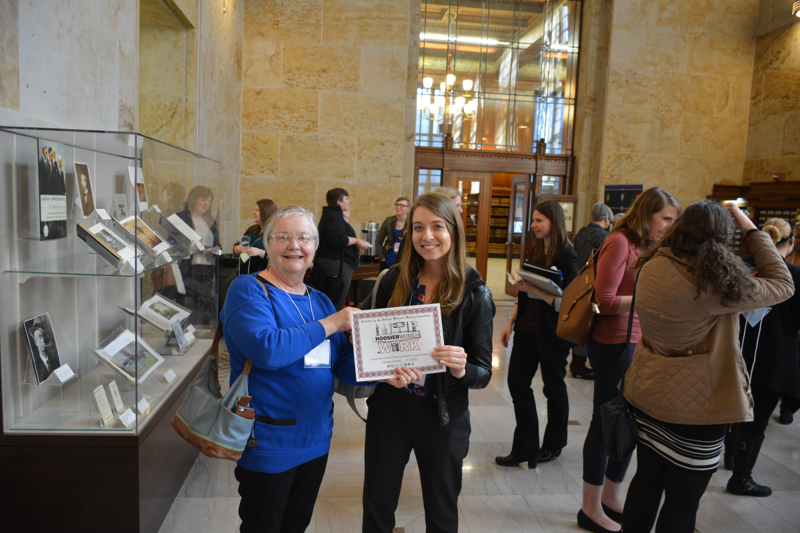 April 1, 2017 marked another successful Hoosier Women’s History Conference at the Indiana State Library. 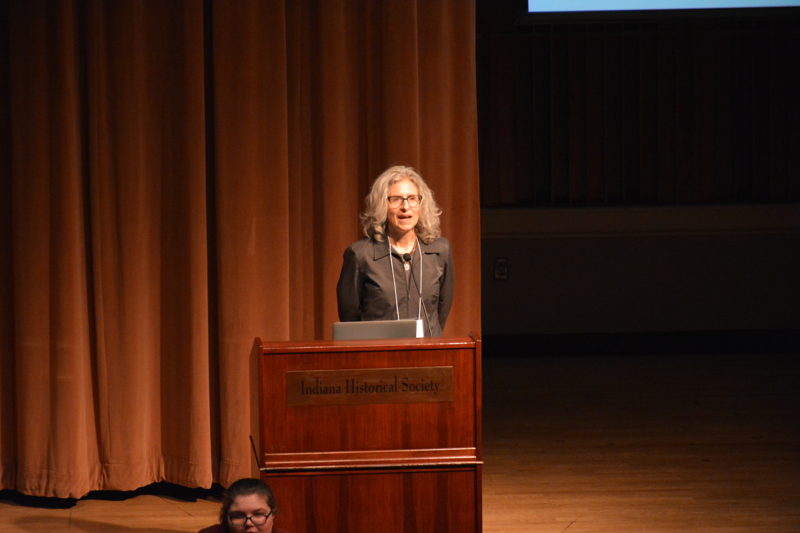 This year’s theme was “Hoosier Women in Science, Technology and Medicine.” The attendees heard talks about Indiana native Melba Phillips, who pioneered physics theories, studied under the famous J. Robert Oppenheimer and advocated for women’s place in science research. We listened to talks about Gene Stratton Porter, author and naturalist, and learned how Hoosier women continued to be at the forefront in one of the first public ecology movements, removing phosphates from laundry detergent. There were sessions on women pioneers Dr. Edna Gertrude Henry, founding director of the Indiana University (IU) School of Social Work, and Dr. Emma Culbertson, surgeon and physician. 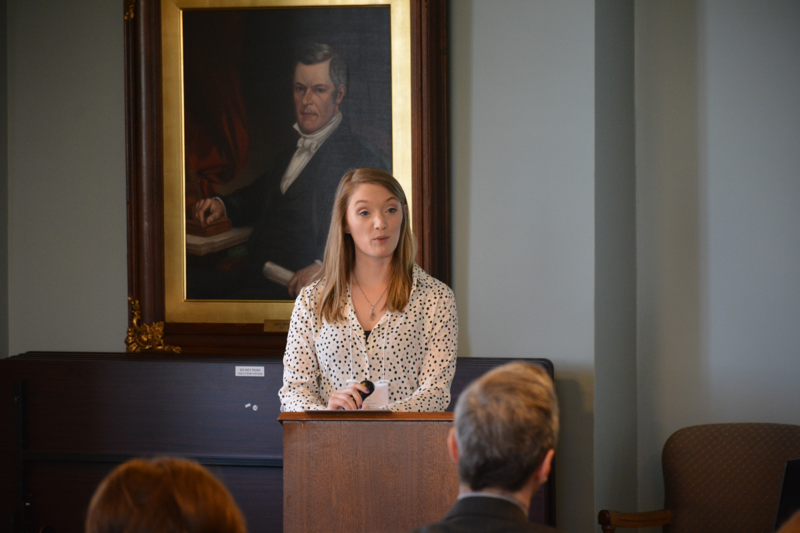 The presentations covered how they overcame gender discrimination to practice and teach in the field of medicine. Speakers also told us about the many women who broke barriers at IU that had long blocked them from pursuing careers in medicine and public health. Dr. Vivian Deno, Purdue University, talked about Dr. Kenosha Sessions, the long-serving head of the Indiana Girl’s School and her mission to use scientific methods to retrain young women and Dr. Elizabeth Nelson, from the Indiana Medical History Museum, discussed how using technology in making a patient newspaper provided a forum for self-expression and promoted patient literacy and self-confidence. Jessica Jenkins, from Minnetrista in Muncie, Ind., gave an interesting talk on the Ball family women and their fight for improvements in improving sanitation, hygiene and medical access, while Rachel Fulk told about the discrimination that African-American women faced in 1940s Indianapolis in obtaining medical information about birth control. Nancy Brown reminded us of Jeanne White’s fight to educate others about AIDS so her son Ryan could attend school while a group of women in Kokomo were also searching for scientific information about the disease to keep their own children safe. There were talks about the 19th and 20th century and “Scientific Motherhood,” using scientific and medical advice to raise children healthfully. Sessions also highlighted the fight of many to enter the fields of scientific study at Purdue University and the many unrecognized women in in the field of archaeology. 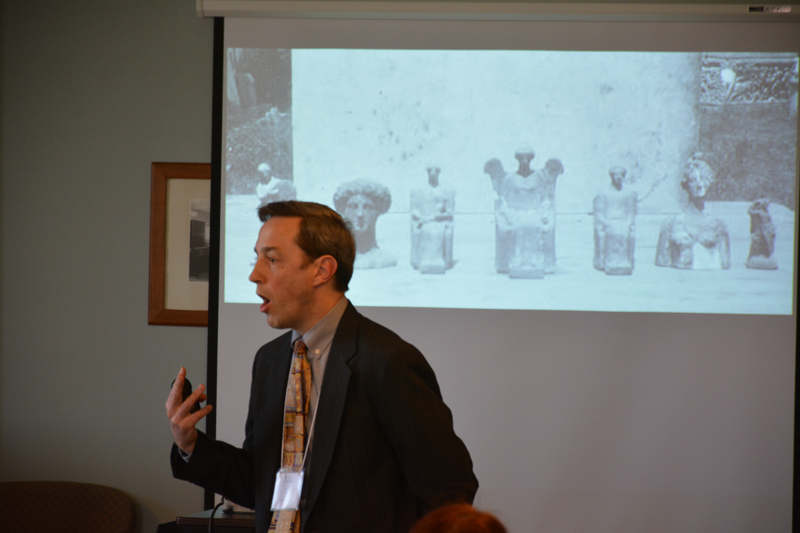 Dr. Alan Kaiser, University of Evansville, gave an engrossing talk on how a noted archaeologist “stole” the work of Mary Ross Ellingson and published it as his own. Look for the third annual Hoosier Women at Work, Women’s History Conference next spring. The topic will be Hoosier Women in the Arts! This blog post is by Reference and Government Services Division. For more information, contact us at (317) 232-3678 or send us a question through Ask-a-Librarian. Ryan Brown has been Communications Director at the Indiana State Library since November 10, 2014. February 24, 2016, will be his last day at the library. In this State Library exclusive, Ryan Brown interviews Ryan Brown. Let the fun and confusion begin. RB: You have been at the Indiana State Library for over a year. What are a few of the highlights of your tenure? RB: I’m glad that you asked. There have been many interesting projects I have worked on over the past year such as the new brochures, door coverings, banners, annual report, etc. One of my favorite partnerships that I developed was with the Indiana Department of Education. 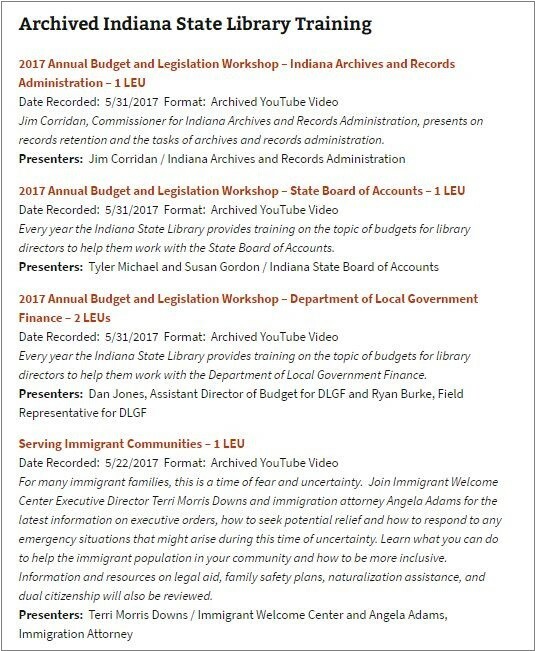 We shared a booth together at the Indiana State Fair last summer and distributed information about the services available at the library to thousands of Hoosiers from all over Indiana. It was great to get out into the community and tell people face-to-face about the awesome collections at the library, as well as our statewide services. RB: What are some of those collections and services? 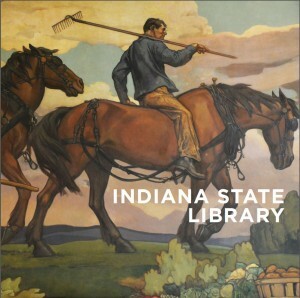 RB: The Indiana State Library has one of the largest genealogy collections in the Midwest. It also has a huge inventory of rare books and manuscripts, government documents, newspapers, large print books, as well as talking books and Braille. There are also many online services available to Indiana residents like INSPIRE.in.gov, Indiana Memory and Hoosier State Chronicles. All of these items and services are free to Indiana residents. If you have any questions about the collection or services, you can Ask-a-Librarian. RB: Wow! That is a lot of stuff! RB: We are starting to sound like a commercial. RB: Nah, it’s just good PR. RB: Anyway…it seems like a year is not a long time to be at a job, why leave so soon? RB: The main reason I took a new job was so I could eventually move to South Bend where my wife is originally from. RB: Do you remember a few years back when you promised your wife that when you were ready to have children the two of you would make an effort to move to that area? RB: Well…the time has come. RB: Wait a second; am I going to be a father soon? RB: Not at the moment, but you were going to start trying. RB: Ah yes…now I remember…what else? RB: I would say overall that I have enjoyed my time here at the State Library. There are a lot of great people on staff and working here allowed me to practice many of the skills I learned at school. Plus, we had many accomplishments in that short time period. We saw significant increases in event attendance as well as use of our services like INSPIRE.in.gov. RB: What are some of the challenges you faced at the library? RB: One of the biggest challenges was getting the media interested in what goes on at the State Library. Though, we did have a ton of press about our partnership with the Indiana Department of Natural Resources. RB: The State Library acquired State Park passes from the Indiana Department of Natural Resources that are available at local libraries so patrons may check them out. The program started in January and has been very popular amongst patrons and the media. Anyone interested in the park passes should contact their local library for more information. RB: What is your favorite item or part of the Indiana State Library? RB: That is a difficult question that you always ask people in interviews. I guess if I had to narrow it down to one item, it would be the original State Flag. I believe that the Indiana Historical Bureau will be taking the flag around the state to various locations this year for the bicentennial. RB: Bicentennial? What is that? RB: Don’t you know? 2016 marks the 200th year Indiana has been a state. RB: Oh yeah? What is the library doing to celebrate? RB: The library has a bunch of projects it is involved with including the new Indiana Young Readers Center, Hoosier State Chronicles, Bicentennial Toolkits for Libraries, Bicentennial Manuscript Collection, and many more! RB: Thank you for taking a few moments of your day and participating in this interview. It has been a pleasure speaking with you. Since Wednesday is your last day, how would someone contact the library if they need info about the Wednesday Word or any communications questions? RB: It has been great interviewing with you Ryan. If you are a librarian or library needing to reach the communications department, please email the State Library at communications@library.in.gov. This blog post was written by Indiana State Library Director of Communications Ryan Brown. Click here for more information on the Indiana State Library. But in honor of Valentine’s Day, at least let them entertain you. Here is just a sampling of cover art that keeps the Talking Book staff entertained on a daily basis. There are hundreds more where these came from, all of which are available to borrow from the Indiana State Library! This blog post was written by Talking Books & Braille Supervisor Maggie Ansty. For more information about large print and talking books, please visit the TBBL website.